Two weeks ago, when I started this series of posts looking at the Web 2.0 features of 24/7 news websites, I intended to look at 8 news providers - based on the fact that they are widely available in the English language in Europe. So far I've examined the sites belonging to Al Jazeera, the BBC, CNN, Euronews, France 24, ITN and Russia Today. In this review I want to look at Sky News. One thing I noted about Sky News was that they promote their Vista Gadget in the tools section of their navigation. It is interesting that Sky seem to have gone for a platform specific version of their desktop gadget, rather than also producing official widgets for the Yahoo! and Google platforms. Aside from promotion of the BBC's 'Skinkers' desktop alerts at the footer of their homepage, I didn't spot anybody else putting so much emphasis on their desktop tools. Sky News also offer a desktop alert service for users without the latest version of the Microsoft OS. 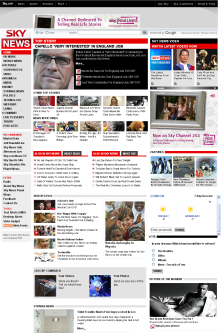 Sky News provides a range of RSS feed content, promoted from the 'Tools' section of the left-hand navigation. The main feed is auto-discoverable from the Sky homepage. Sky News appears to only offer 5 feed options - the homepage, UK news, World news, Business and the enduringly popular 'Strange but true'. Blogs feature in the Sky News left-hand navigation, in the 'Extras' section. The site provides a wide range of blog-type content, but also includes within this section links to areas of the site that are not blogs - for example to Sky's "Have Your Say" message boards. You can also reach the blogs by expanding the 'Comment' link in the right-hand navigation. Sky News seems to have developed their blog portfolio around their correspondent's strengths, with topics featuring politics at Westminster, and specific blogs addressing Washington, Brussels and other 'Foreign Matters'. Sky News have two blogs dedicated to transparency and accountability, with both an Editor's blog and a blog from Viewers' Editor Paul Bromley. The blogs are hosted on the Typepad platform, and feature a plethora of feed links and widgets in their right-hand navigation - RSS, RDF, Google, Yahoo!, AOL, Netvibes, Pageflakes, Rojo, BittyBrowser, Pluck, Technorati, Newsburst, Newsgator and MSN. Despite that, rather annoyingly, the RSS feed is not auto-discoverable. Sky host a set of messageboards. There are ten boards on a variety of topics - although the UK News board seems almost entirely devoted to speculation and conspiracy theories about the Madeleine McCann case that used to form part of Sky's primary navigation. They announced on 18th December via the Editor's Blog, that users would now be able to add comments to individual stories using a form at the foot of the page. The launch of this functionality did not go smoothly it seems. "There have been one or two technical glitches on these; sorry about that - I hope they will be fixed asap." I'm currently unsure of the status of this functionality, as I've not been able to find an example of a news story with the form in place - although possibly they will be there by the time this review is published. 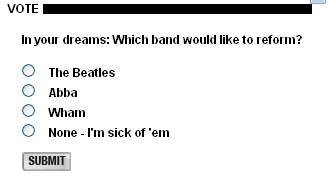 Sky News features a simple multiple choice on the website homepage. Users have to vote before they can see the results, and the results are not aggregated with any SMS or on-screen red button votes run by the channel. 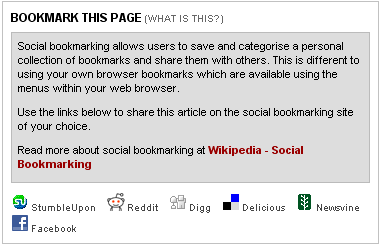 Social bookmarking links are included at the foot of each story - to StumbleUpon, Reddit, Digg, del.icio.us, Newsvine and Facebook. A 'What is this' link expands a panel above the icons to explain the funtionality. This is a nice way of doing it in the context of a page, rather than taking the user off to a separate 'help' page. In the next part of this series I'll be looking at the search functionality offered by the sites I've been reviewing. This post is one of a series looking at the websites of the 24/7 TV news channels most widely broadcast in Europe and the UK. It features in-depth reviews of the Web 2.0 features of the Al Jazeera, BBC, CNN, Euronews, France 24, ITN, Russia Today and Sky News websites. If you liked this post, you might also be interested in Newspapers 2.0: How Web 2.0 are British newspaper web sites?, or Chipwrapper, a search engine for British media. Additional research by Claire Forrest. By Martin Belam on 21 January 2008.